In the wake of the kerfuffle over embargos on Jalopnik and The Truth About Cars, Autoblopnik has decided to take a stand on this very important issue. Automakers have long threatened to lock out publications that break embargoes by publishing information early, provided those publications don’t buy a lot of advertising and/or produce lots of dealer referrals. 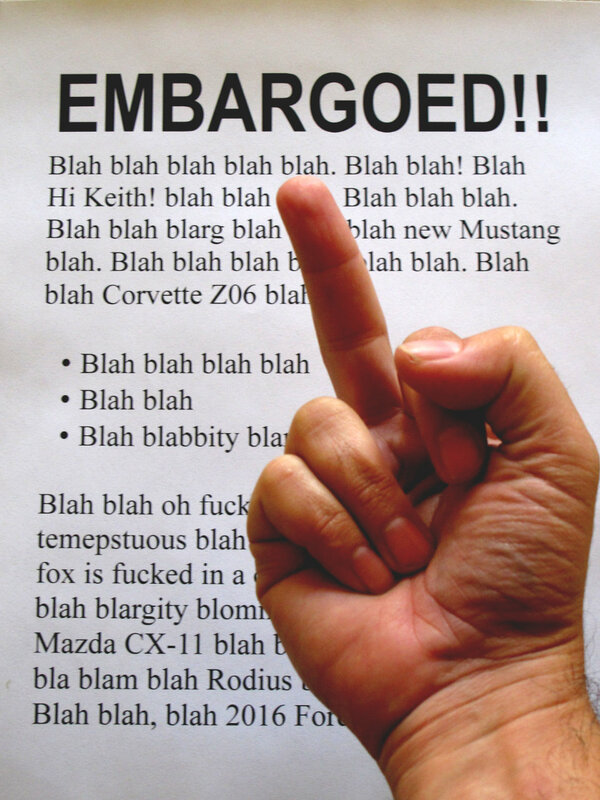 Jalopnik has now said that they will no longer honor embargos on information, although they will honor embargos on first-drive impressions from press trips, because those are the ones that involve frequent flyer miles, posh hotels, and all the booze you can drink, gratis. TTAC’s Jack Baruth responded by saying that the entire automotive industry is doomed, auto writing is a farce, the whole universe is fucked, and the future of automotive reporting lies with Time Magazine. Given the perceived importance of this issue, Autoblopnik feels it is important to take a stand. From this point forward, Autoblopnik will not follow any embargo as established by the automakers. Instead, we will set our own embargos. For example, if Chevrolet sends us early specs on the new Corvette Z06 (hint, hint) with an embargo date of January 13th at 10:30 am, we will rip up that embargo and set one that works for us… most likely, for the sake of convenience, January 13th at 10:30 am. Or maybe we’ll release it half an hour later, because we’re unpredictable like that. What we will not do is be like every other automotive web site and release the information early. That way, we can continue to be predictable and get free food while refusing to be pushed around by the man. As Jack Baruth so eloquently points out, this policy could, in theory, be used to give us more time to construct well-written and grammatically-correct articles for your reading enjoyment. However, in order to keep the playing field level, we will continue to honor the blog-industry model of paying $10 per post to fresh-faced college grads who would whore out their own mothers if it meant given the opportunity to tell their friends they work for a publication that was once allowed to borrow a Lamborghini for a day. We hope this stance will send a strong message to the automakers: You cannot dictate our editorial schedule. We will not acknowledge the fact that without the information you provide, we are effectively out of business. We will not pretend that if we read the information with another site, we can gleefully forward your corporate message while telling the world that we are independent mavericks. And most importantly, we will not follow the industry trend of posting news before you intend it to be released. Instead, we’ll take our own sweet time and post it when we want to post it. If that just so happens to fit perfectly into your embargo plans, just remember that Autoblopnik prefers aisle seats and rooms with an ocean view.